We no longer support File.AL. We added that you wanted! Thanks for adding, but it's not working now. (22.01.2017 20:06)steveeven Wrote: Thanks for adding, but it's not working now. It starts to reset after about 4-5 hours. why was your premium account suspended after a few days? I hope you guys somehow manage to get it to work. Maybe contact file.al assholes and ask them if they would enable your account in return for you to put banner/ad for them on your site? I paid with bitcoin, there is nothing to do now. (31.01.2017 04:11)fe33333333 Wrote: I hope you guys somehow manage to get it to work. Maybe contact file.al assholes and ask them if they would enable your account in return for you to put banner/ad for them on your site? They do not open an account. this means you will never ever buy a file.al premium account again? 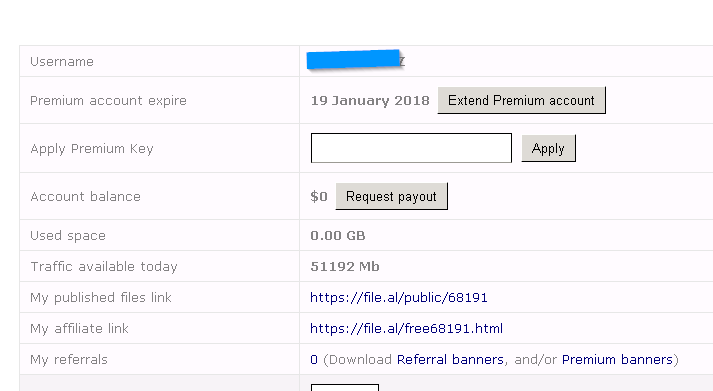 (31.01.2017 19:57)harold.gulbranson Wrote: this means you will never ever buy a file.al premium account again? Yes but we will work on it.